Bowflex is America’s favorite home gym and has helped thousands of people achieve amazing results. Each of Bowflex’s product is designed with innovative technology and exceptional quality to deliver the results you want. Bowflex home gyms can help you completely reshape your body. If you want to lose weight, get in great shape and feel great than a Bowflex home gym is for you. Products from Bowflex includes the Power Rod series that features an innovative, no-change-cable pully system. This allows you to move from exercise to exercise quickly for a fast and effective workout. Then there is the Bowflex Revolution Home Gyms with the revolutionary SpiraFlex technology that is transforming bodies at home like never before. 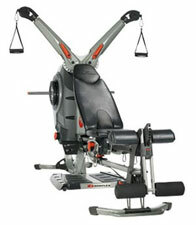 Plus there is always the classic Bowflex, a great value with all the basics need for a great body. It utilizes the same Power Rod resistance as the top-of-the-line Bowflex models. Affordable financing plans are available with Bowflex, starting as low as just $10 a month. Visit Bowflex’s website today to find the right home gym for you and to request a free information DVD.